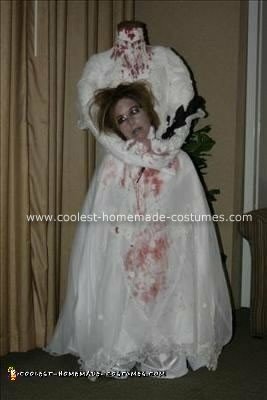 This Headless Bride Halloween costume is my wife Deb. We wanted to create something cool but a bit spooky. We purchased a wedding dress at the local Goodwill store then went on to basically destroying it. I took one of her old turtle neck shirts, put a roll of nylon covered paper towels in the neck and proceeded to fill the shirt with expanding foam. This took several days because the foam won’t dry if it gets to thick. After we had the upper body built and fitted in the dress we made it comfortable to wear. We had to use 2 small rods to hold the upper body close to hers. Basically the foam went from the shoulders of the wedding dress to Debs low back. After everything fit we cut a hole for debs head and arranged the arms to make them look like they were holding her head. It was held in place with ace bandages. Some fake blood, a bunch of makeup and a few black roses. We had the finished product just as envisioned. are these hard to walk around in? I spend hours out on Halloween with my friends, and I’m wondering if it is uncomfortable to wear on your back all night? is she walking around on her knees?